EDITOR’S NOTE: Phawker South American Correspondent St. John Barned-Smith just completed a two year stretch in Paraguay for the Peace Corps. He is currently in Nepal, Katmandu to be exact, and you can almost see neighboring Tibet from there. Next stop is India. He will be sending intermittent dispatches as our newly deputized Himalayan Correspondent. BY ST. JOHN BARNED-SMITH HIMALAYAN CORRESPONDENT I spent three days in Manang waiting for the penicillin to evict that pernicious bacterial infection from my lungs. It was a relief to sling on my backpack, grab my hiking stick, and shake the knots and stiffness out of my body. 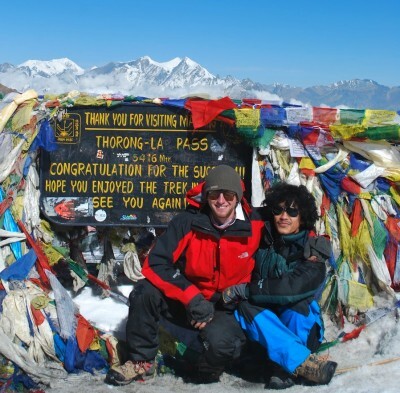 But I was apprehensive – Thorong-La loomed large, equal parts “I’m going to cross one of the highest passes in the world!” and “Oh God, that’s high, am I going to be able to breathe?? ?” And the air WAS thin. Yuvash and I walked with the Israeli and Aussie backpackers we’d linked up with in Manang. We made slow progress – as long as we kept our steps slow and steady, the hiking didn’t pose too much of a problem. But upwards climbs or a faster pace reduced us into gasping gulps of air. The landscape was about as stringent as the air – scrubby, dry views where green patches of grass looked like calm oases. We stopped in Yak Kharka, a couple of hours outside of Manang. Four men were playing dice on a bedraggled Yak pelt, rattling the dice in a small bowl and slamming them onto the pelt with a high-pitched yelp. I devoured some vile, greasy noodles while they played, and after lunch we made another quick hike to Letdar, where we spent the night in a lodge with some Belgians and Frenchmen. I also ran into a contingent of adventure skiers on their way back from a trip. One of things that had puzzled me on my trek was the stubborn lack of Americans, and suddenly I couldn’t escape the surreal barrage of “Dude!” and Colorado skiing-talk from these boys from Telluride. The next morning we set out for Thorung Phedi (4200 meters), where we started seeing melting piles of snow, and the color palette devolved to brown, white, gray, and blue. We continued to High Camp, where we would spend the night before hiking for the pass the next day. The hotel had been planted in cleft high above the river, which snaked its way south below us. It was a compound of three buildings surrounded by huge piles of shale which climbers would scale to get a scrap more altitude and ever more epic and beautiful photos. I scaled to the top of one, crowned by rock towers other trekkers had built for good luck, and a series of shrines adorned with streams of Tibetan prayer flags, the once vibrant colors fading beneath the harsh mountain sunlight. The whole valley spread out below. A scattering of mountains on my left looked like a series so craggy spikes. In front, a whole shelf of peaks wreathed in clouds. And all around, the brown and black scree, like unroasted coffee beans. I spent the night buried under two blankets (which seemed to have more dust than stuffing, but no matter). The next morning Yuvash and I headed for the pass. We started at 5:30 AM – we’d been warned that if you cross the pass too late, the winds make the pass almost impossible. The air was startlingly clear, and the peaks were haloed with light from the sun that hadn’t yet risen above them. My memory of that portion of the trek is more scattered flashbacks – the wheezing and gulping in the paper-thin air, skidding across the icy track, the almost instant transition from mostly dirt to above the snowline. A teashop appeared out of nowhere, one of the two way stations put in place for weary trekkers. Two ponies passed by me, steam shooting out of their nostrils like geysers, their riders whooping as they charged up the mountain. And finally, the sun crested the peaks, puncturing the icy chill.After one long last climb (where there always seemed to be ONE MORE ridge just head, we arrived at the top! It was sort of hard to believe, a bit of an anti-climax after the 10 days that Yuvash and I had spent sweating our through to get there. A teahouse (maybe the world’s highest?) was selling tea at 150 rupees a cup. I stripped off my sweat sodden shirt and changed into a new one, gulped down some tea, chocolate, and Ibuprofen. The views, as at High Camp, were unreal. A long line of prayer flags, and behind us, the icy, snowy peaks. In front, Mustang (Nepal’s closest region to Tibet), and the nearly 2km drop to Muktinath, hidden in a rain shadow that left whole mountains devoid even of scrub. There, there were mountains as well, soaring above a thin line of recently formed clouds. 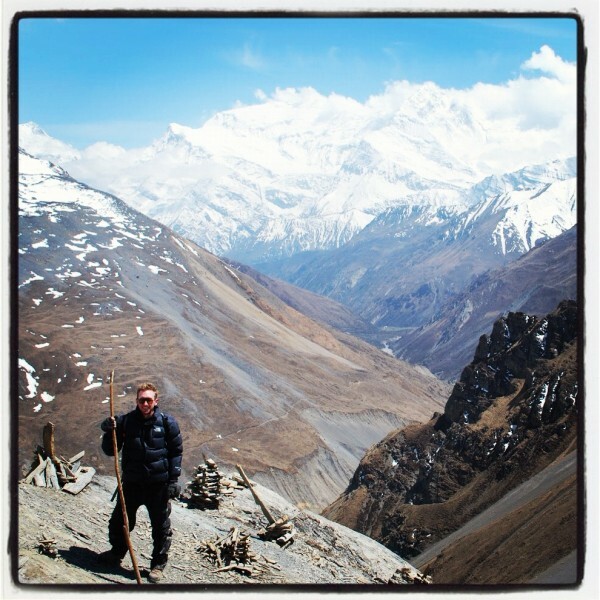 I started down to Muktinath once my toes started going numb. My knees started aching almost immediately. The descent is 1800 meters, most of it sharp angled switchbacks. Three hours later, I was in Muktinath, with its hot running water. Yuvash and I headed for the restaurant – and the bar. I soon found myself in heaven – slurping down a beer and munching my way through a Yak burger (an immediate, unbeatable argument against vegetarianism). This entry was posted on Friday, May 25th, 2012	at 12:00 pm	and is filed under News	. Responses are currently closed, but you can trackback from your own site.